SPOTTERON is a fully customizable and affordable solution for your Citizen Science, environment protection and volunteer monitoring projects. It can be fully adapted to your project's needs and is constantly updated and maintained. All projects powered by SPOTTERON feature their own custom Smartphone Apps for iOS and Android and an interactive embeddable map application for your homepage. Working with SPOTTERON to design the app was an interesting experience for me. As an ecology PhD student, I knew how to catch Brush-turkeys and design experiments to learn about their behaviour. I knew next to nothing about how to engage with the broader community at large. SPOTTERONS’s expertise was invaluable here, they have experience in designing apps that people want to use, and balance detail with ease of function. SPOTTERON brings a lot of passion and lots of expertise in the field of Citizen Science to the table, to present projects - not only in technical terms - in the right light. The websites for both schweiz-forscht.ch and ecsa-conference.eu are based on good and easy cooperation with our Austrian partners. What I especially like about SPOTTERON, is that we get to use many ideas and new tools that were developed for other projects in the SPOTTERON family without having to pay for them..
To me, SPOTTERON is the successful combination of scientific claim and aesthetic design. The apps work intuitively, are extremely appealing and still fulfill all my scientific requirements when it comes to data quality and safety. Working together happens in a very loyal and trusting way and that allows us to profit from the design- and usability experience SPOTTERON has. With our project Roadkill, we were on the SPOTTERON platform since its beginnings, this way we got to witness the great development of this tool first-hand and were able to contribute in the shaping process. SPOTTERON manages the fine balance between scientific research, community management and modern design. The personal collaboration on a professional level supports the comfortable atmosphere in the project. If you are looking for a dedicated team for the development of a Citizen Science App - even if that has to happen quite fast- you are in good hands at SPOTTERON. Fast communication, straightforward coordination and running updates of the app, even after the release, characterize our successful collaboration. Through the SPOTTERON App "Was geht ab?" we were able to create an appealing and useful possibility for kids, to spot problem- and feel-good areas in their home- and school surroundings. In the SPOTTERON team we found reliable and creative partners, that care about more than just the implementation. With our SPOTTERON App Nature's Calendar ZAMG we are always technically up-to-date. As a result we are able to offer our Citizen Scientists a tool which is also appealing to today's generation without having to worry about any technical questions. 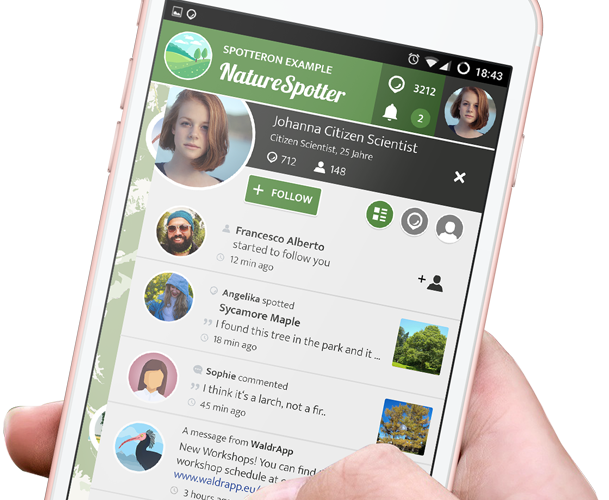 Working with SPOTTERON implies working with a professional partner on the topics of Apps & Citizen Science. I was always very pleased about the reliability, but also the openness to try new things and the possibility to exchange with competent partners. Thanks! Thanks to the experience and the knowhow as well as the basic structure of SPOTTERON, we were able to have the CrowdWater apps developed in no time. We consider the model that allows every project to use all newly developed tools very fair and transparent. This way our apps even got some new features, we didn't even know we needed before. Through SPOTTERON we share more than just an app infrastructure with other projects, we also share ideas. This way we get to develop and constantly improve user-friendly apps, which are easy to handle and work for many different kinds of projects. I’m amazed by SPOTTERON's passion for CitizenScience, impressed by their energy and initiatives and grateful for what I’ve learned by collaborating with them on the Fjällkalendern app. The core features of SPOTTERON cover a wide range of innovative features for Citizen Science apps, while maintaining low prices. The custom smartphone apps for Android & IOS and the interactive map are a complete modern toolset for projects for Citizen Science, smart city apps and similar uses. The apps and maps can be individually customized and branded, while recieving regular updates during the whole runtime. Our development team is ready for extending the platform with new features for your project needs. For your project we release your own custom branded smartphone application for Android and iOS. You can integrate your own SPOTTERON project directly in your website via iFrame and allow submission also for desktop users. The SPOTTERON full feature package also contains a professional CMS website for your project. We support your project by supplying professional media like logos, mockups and teasers for Citizen Science projects. Citizen Scientists can submit observations at GEO coordinates with pictures, descriptions and a custom set of data fields. We support and maintain your smartphone application and release regular updates for your project in the app stores. The Citizen Science apps have all features of the platform from start and are optimized for easy use. You can download the spots of your project as CSV or connect your webservices via API in realtime. The users can interact via comments and following and create networks - your project becomes an interactive plattform. The users can comment spots in app or in the map intergrations and keep notified by status updates. Send your users push messages directly on their smartphones as status updates for your project. Running interactive Citizen Science apps also means protecting the privacy and data of all Citizen Scientists.